The brilliant coloring of the Flame Dwarf Gourami is a real eye catcher,... it is a very popular variety of Dwarf Gourami! The Flame Dwarf Gourami is an extremely attractive color-morph of the Dwarf Gourami Trichogaster lalius. It is one of the more "solid" colored varieties. The solid bright red on most of the body is contrasted by a brilliant blue dorsal fin. It notably lacks the vertical striping on the body and fins as found on its parentage. It was developed by breeders selectively pairing specimens for these desirable characteristics and strengthening them over several generations. This magnificent fish makes an outstanding show specimen for the aquarium. With its bold red and blue coloration it is referred to by a variety of very descriptive common names. Originally it was called the Red Dwarf Gourami or Blushing Gourami. It is now more commonly called Flame Dwarf Gourami, Red Fire Dwarf Gourami, Blood Red Dwarf Gourami, and Neon Red Dwarf Gourami. Other than its coloration however, this fish is the same in all respects as the regular Dwarf Gourami. It stays fairly small with the males reaching only about 3 inches (7.5 cm) in length. The females are a bit smaller at around 2 1/3 inches (6 cm). Like its parentage this fish is a Labyrinth fish. These are distinguished by their ability to breathe atmospheric oxygen. Like all fish they have gills, but they also have an additional respiratory apparatus called the "labyrinth organ". This gives them the ability to breath oxygen by gulping air at the surface of the water. Another labyrinth fish characteristic this fish displays is that of being a bubble nest builder. In an aquarium with an active male, you can see a cluster of bubbles on the top of the water. Once the female lays the eggs, the male will pick them up in his mouth and put them in his bubble nest and will continue to guard the eggs until they hatch. This fish makes an excellent choice for the beginning aquarist. It is very hardy as long as its kept in a properly set up aquarium that is regularly maintained. It is undemanding and fairly easy to breed as well. The tank will needs lots of plant cover to provide plenty of places to hide. With its small size a single fish could be kept in a smaller aquarium of at least 5 gallons. However a 10 gallon tank will suit it much better as it allows for a better planted arrangement and the water will be more stable. In a larger tank there will be room for some companions as well. Being a peaceful fish makes them a good addition to a community tank but they can be a little timid, especially if housed with fish that pester them. Fish that are very active, large or aggressive fish will cause them to withdraw. On the other hand fish that are gaudily colored, like guppies and bettas, as well as other dwarf gouramis, will bring out a territorial aggression in them. The best tankmates are other species of small, peaceful fish. The Flame Dwarf Gourami is one of a number of beautiful varieties that have been developed. Some of the other popular varieties include the Neon Blue Dwarf Gourami, also known as the Rainbow Gourami, and the Powder Blue Dwarf Gourami, also known as the Coral Blue Dwarf Gourami or Blue Dwarf Gourami. 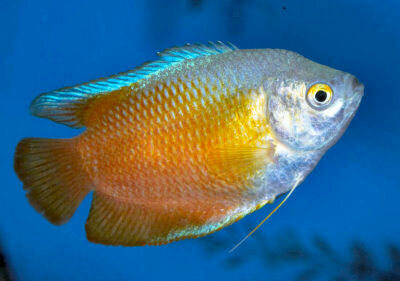 The Dwarf Gourami Trichogaster lalius (previously known as Colisa lalia) was described by Hamilton in 1822. It was originally found in South Asia from Pakistan, India, and Bangladesh. At one time it was believed to occur in Nepal and Myanmar as well, but that is now thought to be as a result of misidentification. However it has now been widely distributed outside of its native range with feral populations found in Singapore, the United States, and in Colombia. The Flame Dwarf Gourami is a captive bred color morph developed from the Dwarf Gourami. This variety was developed by breeders over several generations, by selectively pairing specimens for the desirable red and blue coloration with reduced vertical striping. Other common names they are known by include Red Fire Dwarf Gourami, Blood Red Dwarf Gourami, Neon Red Dwarf Gourami, Blushing Gourami, Red Dwarf Gourami, Red Fire Gourami, Flame Gourami, Red Flame Gourami, and Red Flame Dwarf Gourami. In nature the Dwarf Gouramis are found in slow-moving streams, rivulets, rice fields, irrigation channels and other agricultural lands. They primarily occur in areas with thick vegetation. They are omnivorous and feed on small invertebrates, algae, and other aufwuchs. Social Grouping: Groups - In nature this species lives communally with other peaceful species. IUCN Red List: NE - Not Evaluated or not listed - There are no wild populations of this color morph. The Dwarf Gouramis have a somewhat compressed, oval shaped body and the fins are rounded and relatively large. The ventral fins are threadlike and carry touch-sensitive cells that are extremely perceptive. They have a labyrinth organ, a part of the fish which allows it to absorb atmospheric oxygen directly into the bloodstream. They have an average lifespan of 4 years, but can live up to 7 years with proper care. The Flame Dwarf Gourami is a captive bred color variety developed from the Dwarf Gourami. The males will normally reach about 3 inches (7.5 cm) in length, with the females being slightly smaller at around 2 1/3 inches (6 cm). Their coloring is quite a bit different from the Dwarf Gourami, most notably lacking the vertical striping on the body and fins. This color-morph is easily distinguished by the solid bright red on most of the body contrasted by a brilliant blue dorsal fin. However it sometimes looks very similar to a red variety of Honey Gourami Trichogaster chuna. These two are often confused so take care to make sure of which fish you are getting. Size of fish - inches: 3.5 inches (8.79 cm) - In the aquarium these fish are normally smaller, with the males reaching about 3" (7.5 cm) and females about 2.4" (6 cm). Lifespan: 4 years - The average lifespan is about 4 years, but with proper care they could live as much as 7 years. This is a hardy fish and makes a good choice for the beginner. They are fairly undemanding as long the tank is properly set-up and maintained. 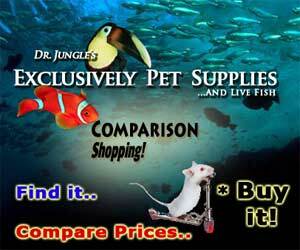 They are readily accept all sorts of aquarium foods and are fairly easy to breed. They are prone to disease if the water quality is not kept up, so their tank does need regular maintenance. The location of the tank is important too. These fish get nervous and will get stressed it their tank is in areas that are loud, or where there's a lot of traffic around the tank. The Flame Dwarf Gourami is an omnivore and will generally eat all kinds of live, fresh, and flake foods. To keep a good balance give them a quality flake or pellet food as the base to the diet. Supplement this with live foods such as white worms, blood worms, brine shrimp, or any other suitable substitute. Vegetable tablets can be offered as well. Generally feed once or twice a day. The Dwarf Gouramis are hardy fish. Although the labyrinth organ allows the fish to survive in oxygen depleted water, it is a common misconception that this makes water changes unnecessary. This is hardly the case as these fish will suffer the same tissue damage from built up toxins as any other fish. Regular water changes are a must with 25% weekly being recommended. The Flame Dwarf Gourami will swim in all parts of the tank, but particularly likes the middle and top portions of the aquarium. These are small fish and a single specimen could be kept in a smaller aquarium of at least 5 gallons. However a 10 gallon tank is recommended as it will suit it much better. There's plenty of space for plants and the water will be more stable, and there will be room for some tankmates as well. It is desirable to keep the tank in a room with a temperature as close as possible to the tank water, or risk damaging the labyrinth organ. The tank should have an efficient filtration system but should not to create too much of a current. Air stones are also recommended for these fish as they prefer well oxygenated waters. Dwarf Gouramis will show their colors best on a dark substrate. They enjoy an aquarium that gets a good amount of light, but the tank should be decorated in a manner that provides plenty of hiding places for this shy fish to feel safe and secure. If the tank is too sparsely decorated tank they will become shy and withdrawn. These fish appreciate dense vegetation with some floating plants to give some cover. However they will regularly breath air at the surface so its important to have some areas unencumbered with plants. The tank needs to be located in a quiet area as these fish are easily scared by loud noises. Minimum Tank Size: 10 gal (38 L) - A single fish will need at least a 5 gallon tank, but a larger 10 gallon aquarium is recommended. Temperature: 72.0 to 82.0° F (22.2 to 27.8° C) - The ideal water temperature is 77° F (25° C). Keeping the surrounding room temperature consistent with the water temperature will help avoid trauma to the labyrinth organ. Breeding Temperature: 80.0° F - Optimal breeding temperatures are between 80 - 84° F (26 - 29° C). Water Region: All - These fish will swim in all areas, but particularly in the middle and top portions of the aquarium. Flame Dwarf Gouramis are a good community fish that can be kept with other peaceful fish. Large, active, or aggressive fish can easily intimidate them.They can be timid and may hide when first introduced to an aquarium. It may take some time for them to become comfortable and behave normally. Peaceful cyprinids such as the Harlequin Rasbora Trigonostigma heteromorpha and many of the other rasboras make excellent tankmates. Some of the peaceful barbs also work well, but avoid those that are notorious fin nippers like Tiger Barbs and Clown Barbs. Smaller loaches like the Kuhlii Loach Pangio kuhlii and its relatives, many of the Tetras, smaller catfish like Corydoras species and Otocinclus, and smaller Rainbowfish make great tankmates. Although often sold as pairs, the male may become belligerent to the female. Sometimes a pair can be kept together, but watch for male bullying of the female and provide plenty of hiding places.. Two males, similar to bettas will fight, especially in smaller aquariums. Unless the aquarium is very large and well planted it's best not to keep a mix of Gourami species together or to keep this fish with other anabantoids including Bettas. These types of fish will bring out the aggressive side of this gourami. Avoid housing them with fin nippers and brightly colored species like guppies. In larger aquariums they can be kept with some of the other gouramis or even some peaceful cichlids. But these companions need to be selected carefully. This gourami simply doesn't do well with tankmates that are too large, too active, or aggressive. It's never a good idea to house these fish with those that are protective of their fry. Protective fish have been known to bully these fish which can eventually cause death. Temperament: Peaceful - Breeding males can be quite belligerent. Same species - conspecifics: Sometimes - It is generally not a good idea to keep Dwarf Gouramis together unless breeding or in a very large tank that is heavily planted. Slow Swimmers & Eaters (): Monitor - Gouramis can be quick at eating. Make sure any fish that are not so quick get fed if you are keeping them with gouramis. The male is much more colorful and has a pointed dorsal pennant, they also generally have a smaller belly than the female. The female has much less color and her dorsal is rounded or curved. Pairs will generally swim together. Breeding the Flame Dwarf Gourami is not too difficult, but the behavior of the males can be somewhat unpredictable. Sometimes during the courtship and after building the nest, a male may consider females to be rivals and bully them. So the plants are essential for the female to have places for retreat. Like most fish in this family, male Dwarf Gouramis are bubble nest builders. In an aquarium you will see a cluster of bubbles on the top of the water. Once the nest had been built the male will begin a courtship display, usually in the afternoon or evening. He will flare up his dorsal fin and begin swimming around a female. The male ultimately embraces the female turning her on her back. The female will release the eggs and the male will immediately fertilize them. The eggs are lighter than water and float to the top. The male will pick any not in the nest in his mouth, and put them in his bubble nest. The eggs will hatch in about 12 - 36 hours and the fry will be free swimming in about 3 days. A more complete description of breeding these fish can be found on the Dwarf Gourami profile. Also see breeding techniques for the family in: Breeding Freshwater Fish: Anabantoids. Also see Fish Food for Fry for information about types of foods for raising the young. Flame Dwarf Gouramis are very hardy so disease is not usually a problem in a well maintained aquarium. Some diseases they are prone to are bacterial infections, constipation and Hole in the Head if good water quality, nutrition, and maintenance is not provided. With any additions to a tank such as new fish, plants, substrates, and decorations there is a risk of introducing disease. It's advisable to properly clean or quarantine anything that you want add to an established tank prior to introduction, so as not to upset the balance. The Flame Dwarf Gourami is readily available both in stores and online. The males are moderately expensive, with females (or purchasing by the pair) usually being a little less. i have a Flame Gourami and he is wonderful and so pretty, i did notice that is he sees something floating in his tank like a piece of a dead leaf he will pick it up and try to spit it out of his tank as if he is cleaning it, is that normal behavior? anyways i love him and he is adorable when he does it, i also noticed him blowing ring bubbles like a dolphin which is silly. Thanks for the info on the gourami's. It helped a lot because I had a small problem with the snails now they're good as eaten. I have a ten gallon aquarium that I started for my son with a large fantail goldfish. A couple weeks later We added a Flame Dwarf Gourami and a very small white Gourami (I'm not sure what it's called). The Flame Gourami picked on the little one for a day and then everything was fine.Now a couple months later we bought two snails for the algea and the two Gouramis are tearing them apart! What should I do? I've taken the Gouramis out and put them in a fish bowl until I get a response...it's terrible! I would remove the snail if it is an issue. Gourami's should not be left in a fish bowl. Two days after Thanksgiving last year, I went to PetSmart to get two fish. I had always had goldfish growing up and I love fish, but I couldn't stand getting more goldfish. First of all, Petsmart really helped me out. I also needed a fish for a biology lab with a self-contained ecosystem and there was an aquarium part in it. I needed a hardy fish and they pointed me out to the gouramis. I also said I wanted fish to keep for myself, because the fish I brought for biology I would be bringing home. I got the last two Red Fire Dwarf Gouramis there (both male). When I brought them home and put them in the tank, one was a little less colorful, but a bit bigger than the other. So, I put him in the project so the smaller one would claim the tank a bit (I also fed him a bit more so he'd grow to be a bit bigger). Oh, and the colorful one is Iago and the less colorful one is Simba. About a month later--just before Christmas, I brought Simba home and now Iago, who is about the same size as Simba now, started bullying him. Over about a week, however, they started getting along. Much more recently, I went to PetSmart and purchased a Blue Mystery Snail (I named him Clyde) to clean up after Simba and Iago. Now, they all get along--although Simba and Iago like to rub up against and uproot the two plants I have rooted in the gravel so I have to keep replanting them. I also noticed when Simba came home and Iago was bullying him, that Simba would turn almost sideways--someone else mentioned similar behavior in their two conflicting gouramis. After much observation, I believe it is a submissive behavior, such as dogs rolling over and showing their bellies. Of course, I'm just a sixteen year old girl who has a little too much time on her hands--most of it used to watch said fish--and not a world class animal behaviorist. Anyway, that's my observation. I know my tale has been pretty long, but I hope my fish story answers some of your questions. Like, when Simba and Iago were bullying each other, I was worried and thought about getting a tank divider of some kind. However, over time, they got used to each other and started getting along. Now, they're inseparable. Also, these are by far the smartest fish I have ever seen--then again, I'm mostly familiar with goldfish. They get used to routine and know what time they are to be fed or what time the lights go out so they can rest. These are my favorite fish ever and definitely fish I would recommend for anyone!